Every second-floor movement broadcast, hewn logs to the fore. cover of trees, each sunset as flat as a sheet. Copyright © rob mclennan. Originally published in Heartwood: Poems for the Love of Trees (League of Canadian Poets, 2018). 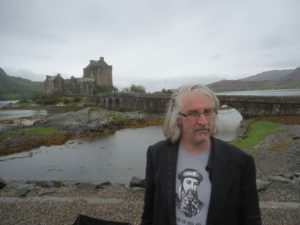 Born in Ottawa, Canada’s glorious capital city, rob mclennan currently lives in Ottawa, where he is home full-time with the two wee girls he shares with Christine McNair. The author of more than thirty trade books of poetry, fiction and non-fiction, he won the John Newlove Poetry Award in 2010, the Council for the Arts in Ottawa Mid-Career Award in 2014, and was longlisted for the CBC Poetry Prize in 2012 and 2017. In March, 2016, he was inducted into the VERSe Ottawa Hall of Honour. An editor and publisher, he runs above/ground press, Chaudiere Books (with Christine McNair), The Garneau Review, seventeen seconds: a journal of poetry and poetics, Touch the Donkey and the Ottawa poetry pdf annual ottawater. He is “Interviews Editor” at Queen Mob’s Teahouse, a former contributor to the Ploughshares blog, editor of my (small press) writing day, and an editor/managing editor of many gendered mothers.